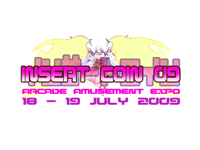 Bandai Namco Games and Capcom jointly announced yesterday that a collaboration deal regarding amusement business was signed by the two companies. The goal of this partnership is maximize games sales, share resources and information and work on common new projects. Their first joint product will be a Mario Party themed redemption game. This is not the first time that Bandai Namco Games uses Nintendo's popular character already seen in both Mario Kart Arcade GP. Capcom also works with Nintendo since some games like Tatsunoko VS Capcom are powered by a Wii based hardware. Scheduled for Autumn 2009 in Japan, Mario Party will offer a wide range of mini games and will accept up to 16 players. 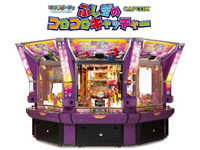 Lately, redemption machines gained more space in the amusement industry. As for all new trends, the lack of experience and information in this field prevents operators to reach the best income this kind of machines can provide. To address this problem, KWP Limited (editor of the popular "Stinger Report") will start publishing tomorrow a newsletter named the "Redemption Report". This one will regularly offer precious information such as the latest news, charts of the best machines, but also many tips and advices to make the right choice and boost your income. The "Redemption Report" will not only cover tickets machines but also token (pushers) and skill games as well as prize vending machines. As a consultancy company, KWP Limited is well known for its clear vision of the market and the accuracy of both its analysis and advices. 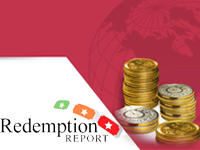 You can subscribe to the "Redemption Report" for free through the official website: www.theredemptionreport.com. 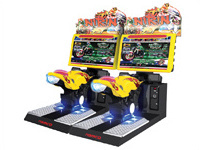 Today Namco launches it's newest street-racing game: Nirin. But this time, players ride bikes. There are 5 different ones (Naked, Super Sports, Big Scooter, American et Super Motard), each with its own characteristic: speed, acceleration, handling and turbo boost. Night races take place on five urban courses with different difficulty levels. Accelerating boosts can be built up by banking the bike left or right. 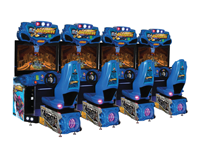 There are several play modes: Single Race (challenging rival teams and beating the boss to win a free game), Time Attack and VS Battle (offers up to four players head-to-head). Nirin is powered by System ES1 and features a 42â€ hi-res deluxe LCD screen. Bandai Namco's new shooting game Razing Storm is available in Europe! 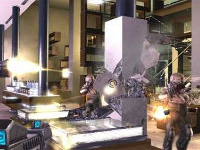 In this futuristic shooter made by developers of the Time Crisis series, you are a SCAR (Strategic Combat And Rescue) squad member fighting your way through South America to bring down a terrorist organization. The year is 2030 so you'll have to cope with giant war machines amongst usual enemies. This title associates efficiency and originality. Efficiency thanks to the featured pedal system which made the success of Time Crisis, guns with recoil effect, 60" monitor, 5.1 DTS sound system and originality with the totally destructible scenery, sequences with alternate gameplay and above all: introduction of artificial intelligence! It means that enemies will behave differently for each new game. So no more movements pattern memorizing possible! Weapons include but are not limited to machine gun, cluster and rocket-launcher. As you can see, all ingredients are there for mass destruction! This teaser video should convince you of this. The other strong point is that this game runs on Namco's new System 357. It offers impressive graphics which are much better than what is usually seen in arcade games these days. Very enjoyable and technically awesome, this is the best shooting game on the market today. Razing Storm is a sure bet that will stand the test of time!!! 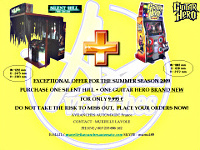 Contact your local Namco distributor to order this machine, you won't regret it! Manufacturer: Bandai Namco. Size: 164(w)x179(d)x233(h). Weight: 385Kg. Mecha Kitty to hit Japan this summer! Banpresto just unveiled the next update to its latest title. 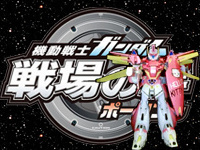 The name is Mobile Suit Gundam - Senjo no Kizuna "Kitty no Densetsu Edition". This is a special edition of Mobile Suit Gundam - Senjo no Kizuna featuring guest appearance of Hello Kitty! Kunio Okawara (mecha designer of the many Gundam series) himself imagined the "mecha-kitty". Available this summer in Japan as an online update, this version will add a bonus stage set in the world of Hello Kitty and special weapons such as the flower cannon... Players will have to meet certain criterias in order to unlock this extra content. 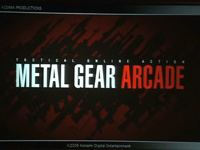 A small Hello Kitty face will appear on title screen of cabinets where it is available. Exclusive Mecha Hello Kitty action figures will hit the stores at the same time. This is an April fool!